The Vaughan String Quartet is producing and performing a series of musical events to celebrate Canadian classical music in the year of the 150th anniversary of our country. 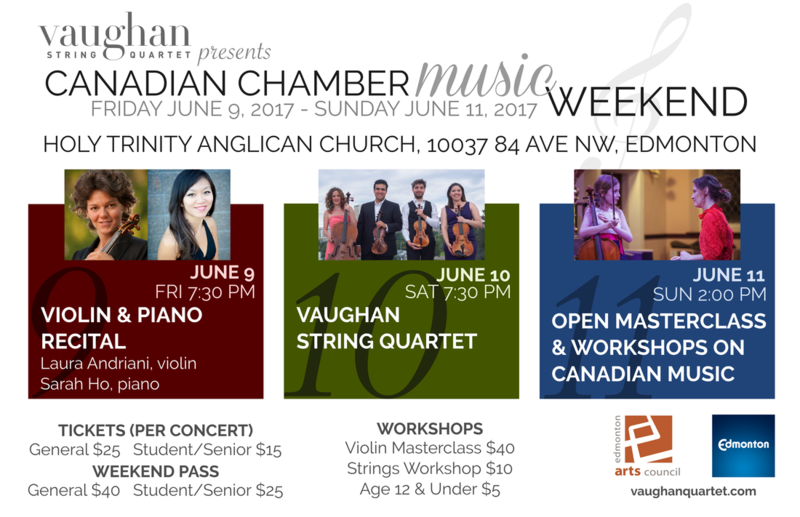 This festival is taking place from Friday June 9th to Sunday June 11th 2017 at Holy Trinity Anglican Church in Edmonton and features masterpieces from the standard repertoire and Canadian Music for string quartet and for violin and piano. The project is meant to promote the participation of classical music lovers in the community at different levels. Besides the opportunity to attend two outstanding concerts, we offer the occasion to access music trough free group lessons on string instrument and a violin and viola masterclass for advanced player. *If you wish to attend the Violin/Viola Masterclass, please purchase your ticket below. The Violin and Viola Masterclass is held by violinist Laura Andriani: students from RCM level 4 or equivalent are welcome to participate. Possibility to work on Early Music as well. The 40 dollars fee is for 30 minutes of individual and public lesson. This fee is for students of all ages. Auditors are welcome to attend. Auditor fee is 10 dollars. The masterclass will start at 2pm in the Upper Hall at Holy Trinity Anglican Church. The availability is limited to 10 students. In case we will receive more requests we will work to accomodate them in other days. The String workshop is for everybody! All levels are welcome and, if you have never played a string instrument, this is the best occasion to start! You can bring your instrument, if you have one, otherwise we will provide you with violins, violas, cellos, bows and rosin! You can try the instrument and play some Canadian music with us! The instruments are kindly provided by PJ Tan's Violin Shop, and we will have them in different sizes, good for adults and kids. The string workshop will take place in the Sanctuary at Holy Trinity Anglican Church.